Dimensions 0.25 by 5.25 by 7.50 in. The Herdman children, who enjoy terrorizing their classmates, volunteer to play the main characters in the Sunday school Christmas pageant. None of the Herdmans has ever heard the Christmas story before. Their interpretation of the tale -- the Wise Men are a bunch of dirty spies and Herod needs a good beating -- has a lot of people up in arms. But it will make this year's pageant the most unusual anyone has seen and, just possibly, the best one ever. from Samuel French Inc Plays (August 30, 2009); titled "The Best Christmas Pageant Ever: A Samuel French Acting Edition"
About: Comedy / All Groups / 4m, 6f, plus 8 boys and 9 girls In this hilarious Christmas tale, a couple struggling to put on a church Christmas pageant is faced with casting the Herdman kids - probably the most inventively awful kids in history. About: The Herdman children, who enjoy terrorizing their classmates, volunteer to play the main characters in the Sunday school Christmas pageant. 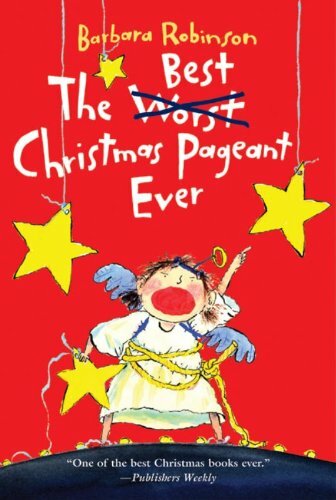 About: Called one of America's favorite Christmas stories, and now a classic television movie, The Best Christmas Pageant Ever has been a favorite of young readers the world over since 1972. About: Laughs abound in this bestselling Christmas classic by Barbara Robinson! from Caedmon Audio Cassette (November 1, 1991); titled "Best Christmas Pageant Ever"
from Turtleback Books (October 1, 1999); titled "Best Christmas Pageant Ever"
from Turtleback Books (September 1, 1988); titled "Best Christmas Pageant Ever"